Swimming is a popular way to stay fit and healthy because it’s a relatively safe and low impact compared to many other sports. However, competitive swimming can introduce new elements of risk that many parents and swimmers may not be aware of. Competitive swimming requires participants to push the limits of strength, stamina and stroke skill to achieve a given distance in the fastest time possible. Events range from 25 meters (for beginning swimmers) to 500 meters (for more experienced swimmers and relay events) and completed in one of the four competitive strokes, butterfly, backstroke, freestyle, or breaststroke. Medley events require swimmers to complete distances in each stroke. Because competitive swimmers are under regular physical strain and pressure to perform, they have a greater risk a greater risk for injury. In-pool injuries and fatigue can also increase the risk of accidental drowning. With the proper precautions, swimmers, coaches and parents can reduce these risks and improve performance in the pool. Most injuries stem from the swimmers putting pressure on themselves to perform the same exercises and strokes over and over again. For example, swimmers who specialize in the butterfly stroke will have a greater risk for injury in the back and shoulders after long periods of training. Freestyle and backstroke swimmers tend to get tendonitis in their shoulders and breaststroke swimmers will find that they are susceptible to knee and hip pain. Cross training can help relieve the chance of injury and diversifies a swimmer’s training program. By incorporating other activities such as cycling, running, yoga, or even weight training, a swimmer has a chance of developing a more balanced workout and less impact on certain muscle groups, which lessens the chance of injury. 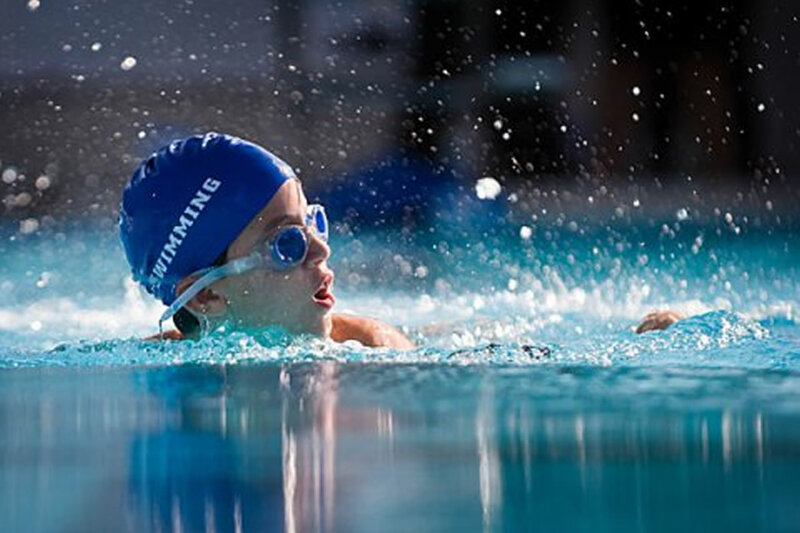 The best way to grow and prepare for swimming competitions is to learn the basic fundamentals early through professional training and supervision. Proper instruction will provide the right guidance for breathing management, water balance, mental strength, and the right technique based on personal body type. With the right instruction, a swimmer has the best chance of better control in the water and faster and smoother swimming in the future. Remember to stretch before any kind of workout. Know your limits and listen to your body. Do not swim when feeling too tired, overheated, sick, or cold. Do not swim alone or without the supervision of a lifeguard, parent, or instructor. Be aware of collisions with other swimmers, which can cause serious injury. Always be prepared for emergency situations and make sure you have quick access to medical attention, just in case. Texas Swim Academy is proud to offer swim team clinics every Saturday and supports seven area swim teams financially in the Houston and Katy area. We can help your child gear up for the season with swimming lessons that focus on improving stroke development for children of all levels ages 4 and up. Your swimmer will get an early start to learn the essential skills and training necessary to build self-esteem and confidence in the water. Click here to learn more about our triathlon, stroke development, and conditioning swim programs. Texas Swim Academy is also partnered with local swim teams in our community. Visit our Community Sponsorship page to learn more.